Maryland Comptroller Peter Franchot did not mince words: "The Mayor has to resign — now"
FILE - Baltimore Mayor Catherine Pugh walks on the Maryland House of Delegates chamber floor before Gov. Larry Hogan's annual State of the State address to a joint session of the legislature in Annapolis, Md., Jan. 30, 2019. 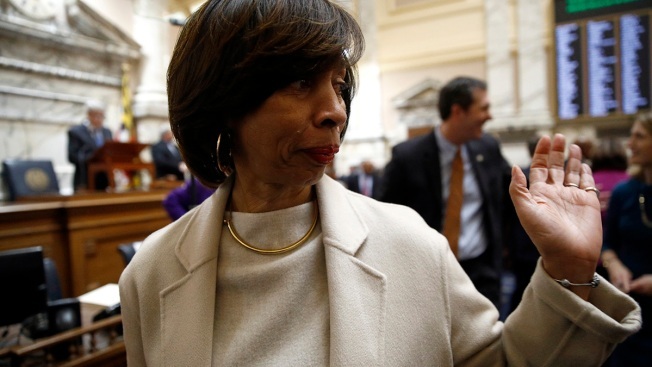 Baltimore's embattled mayor announced Monday that she is taking an indefinite leave of absence, just as a political scandal intensifies over what critics call a "self-dealing" book-sales arrangement that threatens her political career. Mayor Catherine Pugh's office says she feels unable to fulfill her obligations as mayor due to deteriorating health brought on by a recent bout of pneumonia. "She's been advised by her physicians that she needs to take time to recover," her office's statement said, adding that the City Council president will take over the Democratic mayor's day-to-day responsibilities. The first-term mayor's abrupt decision to go on leave indefinitely came the same day that Maryland's Republican governor asked the state prosecutor to investigate corruption accusations against the leader of Maryland's biggest city and the state's comptroller, a Democrat, urged Pugh to resign immediately. In a letter to the state prosecutor released Monday, Gov. Larry Hogan said allegations facing Pugh and her questionable no-contract arrangements to sell her "Healthy Holly" children's books are "deeply disturbing." Hogan said he was particularly concerned about $500,000 in sales over seven years to a university-based health care system "because it has significant continuing ties with the State and receives very substantial public funding." Maryland Comptroller Peter Franchot did not mince words: "The Mayor has to resign — now. The people of Baltimore are facing too many serious challenges, as it is, to also deal with such brazen, cartoonish corruption from their chief executive." Some emboldened members of Baltimore's City Council also want Pugh to resign. Councilman Zeke Cohen asserted Monday that she's "lost the moral mandate to govern and the public's trust." Another councilman, Ryan Dorsey, described Pugh as "an embarrassment to the city." The various officials' calls came shortly after Kaiser Permanente disclosed that it paid $114,000, between 2015 and 2018, for roughly 20,000 copies of Pugh's self-published "Healthy Holly" illustrated paperbacks for children. And it came about two weeks after news broke that since 2011, Pugh has received $500,000 selling her illustrated books to the University of Maryland Medical System, a $4 billion hospital network that's one of the largest private employers in the state. Pugh became Baltimore's mayor in 2016. The next year, Baltimore's spending board, which is controlled by the mayor, awarded a $48 million contract to the Kaiser Foundation Health Plan of the Mid-Atlantic States Inc. Kaiser previously held that contract. When asked who Kaiser bought the books from, company spokesman Scott Lusk said: "We purchased the books from Healthy Holly, LLC." That is Pugh's company, which she has said was meant to encourage healthy lifestyles. Cohen noted that Pugh accepted money from Kaiser for her "Healthy Holly" children's books at the same time the company was seeking a contract to provide health benefits to city employees. Instead of recusing herself from a Board of Estimates vote "she voted in favor of it," he said. Additionally, The Baltimore Sun reported that CareFirst BlueCross BlueShield, another city health provider, effectively bought Pugh's roughly 20-page illustrated books for $14,500 in 2011 and 2014. In a subsequent email, a CareFirst spokesman said it made contributions to Associated Black Charities, or ABC, a nonprofit that manages the city's Children and Youth Fund, to fund its purchase and distribution of books. Associated Black Charities said in a statement that between 2011 and 2016, five organizations donated $87,180 to pay for the books, of which ABC kept $9,552 to use as "general support." The firm Pugh identified as her books' printer said it has produced only 60,000 copies and doesn't have any more orders from Pugh. She's only acknowledged sales of her book to UMMS and said they were meant to be distributed to city schools and day cares. The attorney representing the mayor, Steve Silverman, said the mayor looked "forward to cooperating with the state prosecutor and providing as much information as possible to put this matter to rest." Since the arrangement with UMMS came to light last month, Pugh has stepped down from the volunteer board and returned her most recent payment of $100,000 for the books. At a news conference last week, Pugh described the book deal with the university-based health care system as a "regrettable mistake" and suggested the school system needed to clear up confusion about where tens of thousands of books were. One of Maryland's largest private employers, the UMMS paid Pugh $500,000 for 100,000 copies of books. There was no contract behind the deal and the hospital network described some of the purchases as "grants" in federal filings. Pugh — who once sat on a state Senate committee that funded the major health network before becoming mayor— served on the system's board since 2001. One-third of UMMS board members received compensation through the medical system's arrangements with their businesses. Legislation is pending in Maryland's capital focusing on board governance.